VPNArea is not the king of VPN services. Yet. VPNArea is a VPN service provider that is based in Bulgaria. Modern VPN service providers have developed clever ways of evading unfriendly laws. And hence sometimes these VPN service providers are based in one country but operate in another. Some VPN service providers go as far to market themselves in another country. VPNArea is based in Bulgaria but operates out of Switzerland. All of its operations are hosted in Switzerland. Switzerland, as we all know, is not the most VPN-friendly place on earth. But it isn’t the worst either. IN short, the laws in Switzerland are there for the security of its people. Interestingly enough, the laws in Switzerland do a good job of remaining reasonably VPN-friendly despite their toughness. VPNArea is a VPN service that has quite a few useful features. Moreover, it further augments its offerings with decent customer service support and an industry standard seven-day money back guarantee. You will have to read the rest of this VPNArea review to know how does VPNArea compare with the rest of the industry giants. VPNArea follows the VPN industry trend in the sense that it too offers more than one subscription plan but less than four. IN other words, there are three VPNArea subscription packages. The longer you subscribe to one of the VPNArea packages, the cheaper it will become. The first VPNArea plan is the monthly plan. Users can sign up for this plan for $9.90 per month. If new users increase the subscription period to six months, then the service can be had for $8.33 per month. For users who sign up with VPNArea for a full year, the company grants then a massive discount and they only have to pay $4.92 per month. That’s a mammoth discount of almost 50 percent. VPNArea does not offer any free trial periods. Users will just have to trust the VPN company. Most of the times though, it is a good idea for a VPN company to offer a trial period. This allows skeptical potential customers something to go by when they just want to test the service out before signing up. VPNArea does have a money-back guarantee and new users can use this guarantee to test out the VPN service. So in case a user doesn’t like the look, feel or quality of VPNArea service, he/she can simply get their money refund. OF course, they will have to make a refund request before the first week passes. VPNArea leaves no stone unturned when it comes to payment options. The VPN company accepts a huge range of payment options. So if you’re the type of user who wants absolute anonymity even before you buy the VPN service then Bitcoin is the way to go. The company that owns VPNArea is registered in Bulgaria and goes by the name of Offshore Security LTD.
And because of that fact, VPNArea comes under the jurisdiction of Bulgarian law. As mentioned before, the company’s servers and emails are not present in Bulgaria. They are hosted in Switzerland. Modern VPN services not only cover users on a single device, but they cover them by supporting multiple devices. It allows new users to connect up to five simultaneous devices per account. Five is a pretty good number if you think about it. Most modern internet users will have three or four devices at home. An extra simultaneous connection slot can come in handy in times of need. Moreover, VPNArea makes it clear that the five devices don’t have to belong to one user. In other words, VPNArea is okay with you buying VPNArea for the whole family rather than just you. VPNArea also supports different types of devices. Currently, the VPN service works perfectly fine with mobile smartphones, desktop computers, tablets and even routers. If you don’t go over the limit of five devices, you can connect any device you want to. VPNArea software application is very secure. It is secure because it has some neat in-house security systems installed in it by default. Any user who likes to use a secure piece of software will acknowledge VPNArea’s work in this department. Let’s talk about VPNArea’s Anti-WebRTC system. This system basically fixes the WebRTC leak on operating systems such as Windows. WebRTC leak is essentially a browser exploit. It can reveal sensitive information such as location and IP address of any user even if that user is connected to a VPN service. VPNArea gets rid of this problem by fixing WebRTC leaks via its own WebRTC system. Hence, websites can’t determine a user’s real IP address and location. The second VPNArea security system we want to talk about is ANti-DNS leak system. You see, a VPN service encrypts your traffic. It also blocks your ISPs from spying on you and monitoring your traffic. But a typical VPN service doesn’t block ISPs from knowing the exact names of the websites that a user goes to. Because your computer machine has to use the DNS servers of your ISP to convert hostnames, that is URLs, to an IP. If you enable VPNArea Anti-DNS leak system then you can essentially prevent your ISP from listening in whenever you go online and do your stuff. The Anti-DNS leak feature enables users to change their DNS servers. It also allows users to keep an eye on which country they are in. Does VPNArea Have Kill Switch Feature? VPN services who are serious about your privacy and anonymity always offer the kill switch feature. VPNArea is one of those VPN services. More like VPNArea’s VPN client has the Kill Switch feature. Well, if you use the Kill Switch feature, it protects you in a variety of situations. One of them could be when you have connected to a VPN server but the VPN service experiences an interruption. In that case, the Kill Switch will move into action swiftly and will disconnect you from the internet. This, in turn, will protect your identity from being compromised. That’s all a Kill Switch does. It protects you in case your VPN connection drops by disconnecting you from the internet. This feature is a rather neat one. We say that because it isn’t exactly a separate feature. It is just an added layer of security for users who want secure internet browsing sessions. You can turn it on and then leave to the VPN client to change your IP address after a predetermined amount of time has passed. You’ll have to provide the time to the VPN app in minutes. The VPN app will then assign you a random VPN server after every X minutes, where X is the value that the user gives to the VPN app. Calling VPNArea official website a buffet will not be an overstatement. There is just so much information packed onto a single homepage, that sometimes it becomes difficult to find what you are looking for. Overall though, the website is modern and professionally designed. And hence even with all the information displayed on the homepage, users will not find navigation a problem. The landing page has most of the information that a user may look for and hence users will not have to click too much to get what they want. The layout of the official website is also pretty clean. Moreover, things such as icons and graphics look pretty modern. And hence users will enjoy scrolling up and down on the VPNArea official website’s home page. But that enjoyment will only last for a while. Because after the homepage, the official VPNArea website is a bit of a drag. First of all the information presented is sometimes inconsistent and not well organized. The FAQ section is helpful and rather informative. But it is awfully out of date. It provides a good PR avenue for the company and VPN feature in general. But some of the content uploaded conflicts with information presented on the site elsewhere. You can simply search your way to your solution. There is no search tool though. You will have to use the categories presented to you at the top of the page. These categories include “Members” along with “Buy Now”, “Forums”, “Contacts” and FAQ section. Is P2P File Sharing Allowed On VPNArea Servers? It is allowed on some and prohibited on others. Search the official website for more information. All other servers in other countries are fine. VPNArea offers a lot of options when it comes to the number of servers and locations of those VPN servers. The VPN company boasts well over a hundred high-speed VPN servers that are located in over 54 countries around the world. The main advantage of offering VPN server in these remote and rarely touched parts of the globe is that there is less competition. Moreover, the company can go up on its competitor by claiming that it offers VPN servers in more areas. Add to that the fact that this makes VPNArea look like a genuinely global VPN company with a worldwide network. It is true that most of the users will probably not use VPN servers located in Saudi Arabia. 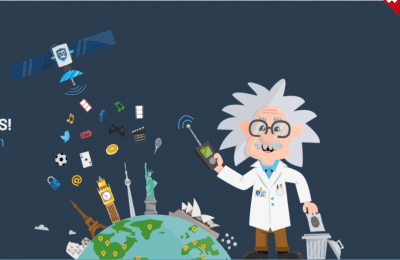 But the option of connecting to one is certainly enticing and may help VPNArea capture the sector of the market (no matter how small) that may feel underserved. You can check the official VPNArea website if you want to check out if a specific country is covered by its vast network. VPNArea doesn’t just list out its features or numbers. It explains them so that users can feel confident about making their purchase. For example, some users will like to search more about each country’s VPN coverage from VPNArea. To accommodate those users, VPNArea has a full network list on its official website. Users can know statistics such as the number of VPN servers in a particularly country and much more. The staff behind the official website have done a rather good job of showing people where VPNArea’s VPN servers are. It should be simple enough for anyone to spot the big button that exists on the homepage to view VPN servers and their locations. VPNArea allows its customers to augment their subscription packages. It allows them to do that via an extra charge of $15 per year. For the extra charge, users can add a dedicated IP with a private VPN server right into their existing package. What does that mean as far as the end user is concerned? It means that users are free to choose their VPN servers from several more countries. Of course, the price of the additional dedicated IP will depend on which country you to sign up for. With that said, it should be mentioned that VPNArea has quietly increased the price of its dedicated IP. We don’t know the reason for it but it doesn’t take a genius to figure out why. VPNArea wants to remain competitive in the market, but also wants to make a profit to keep the business running. 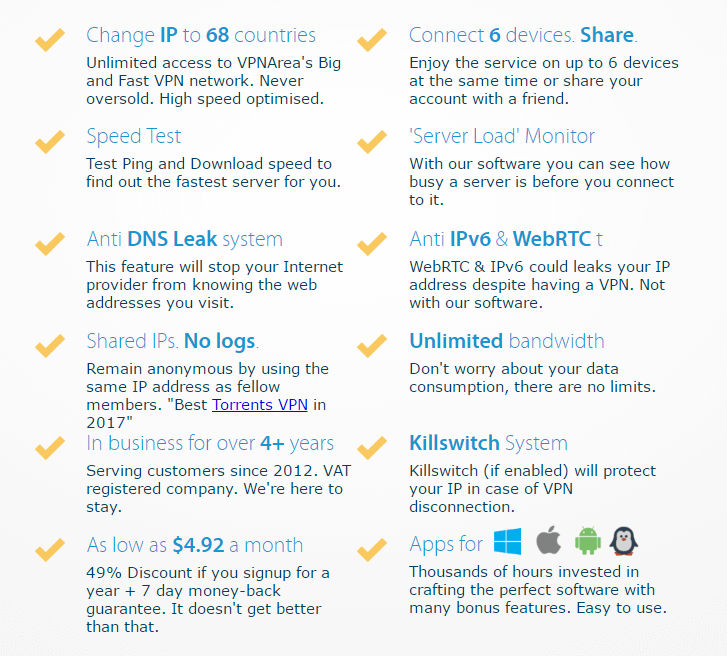 Even at $15 a year, VPNArea is one of the most economical VPN services out there as far as dedicated IP is concerned. VPNArea is perhaps one of the few , if not the only, VPN services that offers its users a private VPN server for free. Who Wants A Dedicated IP? VPN servers that have a dedicated IP address attract a lot of interest from the techies of this world. IN other words, if a user wants to run a gaming server or even an email service, then that user will want to have a dedicated IP VPN server. Moreover, a dedicated IP is better than a shared VPN IP address because it doesn’t get noticed by authorities. Streaming sites such as Netflix also have a tough time in identifying it and then blocking it. Is there a downside to using a dedicated IP address? If you are concerned about privacy then you probably shouldn’t use a dedicated IP VPN server. Because with a dedicated IP server, it is simpler for authorities to link back the account activity to you. By you, we mean the user. The other thing you should know about dedicated IP with a private VPN server is that it isn’t available to everyone. During our research for VPNArea review, we found out that the dedicated IP feature is only available to users who sign up for the 6-month package. Subscribers to the annual package also have the facility of signing up for this add-on. Monthly subscribers do have this facility. As we have mentioned before, VPNArea is based in Switzerland as far as its operations are concerned. This means that it doesn’t have to deal with mandatory data retention laws that are so rampant across other nations in Europe. The fact that VPNArea is registered in Bulgaria also helps the company’s cause. If you read the FAQ section of the official website, you’ll quickly notice that VPNArea states that the company is not really an internet service provider. Why do they say that? They state that because then they can be sure of the fact that they don’t come under the umbrella of data retention laws in Bulgaria. As mentioned before, VPNArea is registered in Bulgaria but works out of Switzerland. And because of the above scenario, VPNArea can ensure that they keep zero logs on their users and their online activities. With that said, it is also true that operating from Switzerland has its drawbacks. Mainly that VPNArea may not come under European data retention laws but it does come under Swiss data retention laws. As mentioned before, Switzerland isn’t exactly VPN heaven when it comes to data retention laws. Moreover, it could also mean that VPNArea could be forced to give up information on its users if Swiss authorities demand it. As a result, we’re not sure if VPNArea can make sure that it does not keep any sort of logs on its users. However, Swiss laws are confusing. No one really knows how they deal with VPN companies. In fact, we don’t even know if they affect VPN companies, to begin with. VPN services work in a gray area and perhaps that is the reason why it is so difficult to regulate the industry. If you search the internet, you will not find any concrete information on how Swiss data retention laws handle VPN service providers. In other words, there is no conclusive evidence if Swiss laws are strict or lax when it comes to VPN service providers. Our VPN experience tells us that it is always better to be safe than sorry when it comes to VPN services. In fact, whenever you see a VPN service boasting about its zero log policy, you should make sure that it really means zero log policy. Most VPN services simply put “zero log” cliche policy out there and don’t back that up with actual implementation. VPNArea, on the other hand, has not yet been labeled as a VPN service that messes around with user data. So, let’s be positive here, and assume that VPNArea really means what it says. But you should always be on your guard. Online security and anonymity are not light matters and hence proper research should precede any major decision. If we’re talking about technical aspects of VPNArea then know that it offers both the OpenVPN and PPTP VPN protocols. For users who don’t want to take chances with their privacy and online anonymity, it is absolutely vital that they use OpenVPN. PPTP isn’t as secure as OpenVPN. In fact, PPTP is rather well known for being a little less than a secure VPN protocol. We have even read reports about how hackers can decrypt it without much effort. OpenVPN, on the other hand, is the most secure VPN protocol you will ever find. On top of OpenVPN, VPNArea secures its VPN connections with a 256-bit AES algorithm encryption. VPNArea is quite accomplished when it comes to customer support. Because it simply has a lot of ways for the customers to interact with the company’s representatives. But VPNArea makes a good impression way before that. The company has a comprehensive FAQ section and this alone can answer most of the user queries in general. It is out of date but customers can get an idea about the answer to their question. They can just confirm it from the VPNArea representative using other methods which we’ll describe below. You can contact VPNArea via email. Their email address is support at vpnarea dot com. If Skype is your thing, then that is available too and the address is vpnarea-support. There is also the option of live chat. All you have to do is click the yellow button that is present at the bottom right corner of VPNArea’s homepage and you’re all set. During our VPNArea review research, we found that VPNArea’s live chat support isn’t a 24/7 service. So the only viable way of contacting VPNArea is email. Expect to get your emails answered within 24 hours. Representatives are generally polite and technically sound. Expect them to answer your questions and provide you with links to more information about the company and your queries. VPNArea also maintains its social media presence through pages. You can contact VPNArea through those social media profiles. Visit Twitter at vpnareacom and Facebook at VPN Area – Offshore Security EOOD for more information. Let’s begin with the signup process first. As usual, the signup process is as easy as you like it. All that is required from the user is a click on the Buy Now button. The Buy Now button is present at the top of the VPNArea homepage. You will be shown a registration form which you will need to fill out. VPNArea advertises that users can sign up within seconds and we think that is probably true. Then the official website will ask you to generate a username and a related password. There will also be text fields for “how did you find out about VPNArea” and an authentication check box. The registration page will also have options for payment methods. Refer to the Price section to find more information about VPNArea payment options. As soon as you have registered with VPNArea, you will be allowed access to Members area. After the registration, it is probably a good idea to check your inbox. There you should be able to see a welcome email from VPNArea. That email will have information regarding account information along with installation instructions and relevant configuration links. You will also receive the email address of the sales team behind VPNArea along with the GM of the company and support team staff. Before you can use VPNArea service, you will first have to install its VPN app. You will need to download the relevant file from the official website. After that, it is a simple matter of following on-screen instructions. To install the app, you will need to click Setup VPN heading in the VPNArea members only area. Then you will need to find the appropriate button for your operating system. We’ll talk about the case where the operating system is Windows 10. But there are other options available as well. After clicking the appropriate button, the website will take you to another page. This page will have step by step instructions on how to install the VPN app on your Windows 10. As mentioned before, the instructions are simple and VPNArea goes out of its way to help you with screenshots as well. Once you have the setup file running on your machine, everything becomes even simpler. The setup wizard will ensure that the installation process is nothing more than just “going through the motions” for the user. The total installation time should not go beyond a couple of minutes for any user. After the installation process is complete, you should be able to see VPNArea icon on your desktop. Right click that icon and run the app as administrator. Run the VPNArea application and you should see a window which asks you for your username and password. Then you will be required to choose your favorite VPN server. After that, you just have to click connect to “connect”. The VPN app should connect you to your chosen server within seconds. VPNArea VPN app is very detailed when it comes to a detailed presentation. All of its features and sections are labeled properly. Moreover, the organization of the app is great and hence you can configure the VPN app to your liking by going to the preferences menu without any problems. With that said, we would have liked the connect button to appear at the top on every window. Instead, the connect button is only available on the app’s homepage. To access advanced options, there is a separate bar on the left. This makes it easy for the user to know what is where. The overall design is user-friendly as well. Below the Home tab, you should be able to see Servers and Speed tab. This tab shows you all the available VPN servers. As mentioned before, VPNArea offers VPN servers in almost all major locations on earth. There is also the facility of conducting speed tests on your favorite servers or even all of the available VPN servers. The page also shows VPN server load statistics and users can see how many other users are using the same VPN server. Users who want to use the Kill Switch feature can do so via its dedicated tab. This tab will allow users to enable or disable the feature. Our VPNArea review research tells us that the feature works flawlessly. It disconnects the internet connection as soon as the VPN connection becomes unstable. And hence protects users from getting exposed unexpectedly. Similarly, users can test out the Anti-DNS Leak feature through its own tab. It also works as advertised. This feature is simple enough. And is even simpler to set up. You just have to either turn it on or off. When you have turned it on, you will have to specify the number of minutes after which you want the app to change your IP. Moreover, you can change the settings at any time you want to. There is also the Settings tab. This tab allows you to configure other options. Other options like if you want the VPN app to start as soon as your operating system starts and auto-connect. The app can also auto-connect to the last VPN server the user used before closing the app. There are other options such as “Check for regular updates” and enable/disable IPv6 leak protections. Measuring a VPN’s speed is a difficult task for the obvious reasons. SO much depends on network conditions and distance of the user’s location from the connected VPN server. But even then, you can make reasonable estimates via highest, lowest and then average VPN speeds. You can test all the available servers and all the locations and then make a sort of table to figure out if your VPN service is fast. Or you can skip all that and just compare the internet speed when the VPN app is turned off to when it is turned on. Our VPNArea review research has shown that VPNArea is a fast VPN service if you connect to servers in Germany and the UK. Some reviewers have reported no drops in download and upload speeds with VPNArea turned on. Of course, that is fantastic. But don’t expect that to be the case with you. With that said, do expect VPNArea to easily handle streaming websites such as Netflix and Hulu. VPNArea will also unblock other content websites in your country if there are any. VPNArea’s performance for the US servers was less impressive than for the UK servers. With VPNArea, you can rest assured that you will not come across any DNS leak issues. But for your own peace of mind, you can check out ipleak.net to make sure there is no DNS leak. Ipleak.net will not only check for DNS leaks, but also for WebRTC leaks. To check against IPv6 vulnerabilities, go to test-ipv6.com. If you go to the official VPNArea website you can find in-depth and detailed instructions on how to set up VPNArea for the above-mentioned devices and operating systems. You can access the guides in the members only area. The VPNArea VPN client works nearly the same across all available platforms. The iPhone and iPad versions have one unique feature which is the OpenVPN Connect App. VPNArea is one VPN service provider that focuses on privacy and anonymity. It is based in Bulgaria but is hosted in another country called Switzerland. The security features on offer are excellent. The VPN app protects users from DNS leaks and the addition of a Kill Switch makes sure the users remain secure even when offline. Other extra features include a dedicated IP address that comes with a private VPN server as an add-on. The customer service is also decent enough. The VPN company does try to make up for it with a seven-day money back guarantee but we’re not sure that’s the best way to go about it. Nevertheless, the VPNArea VPN app is rather cutting edge and perhaps that’s why it will attract customers in the future as well. If you are serious about getting the best value for money VPN then you should check out IPVanish. They are our top ranked VPN provider. Read the IPVanish Review here. VPNArea concentrates in areas that are most important to a privacy-conscious user. THose areas are privacy and anonymity. It has great extra features such as Kill Switch and dedicated IP address along with auto-IP changer. Moreover, VPNArea has a robut VPN app and offers a tremendous number of VPN server locations. The only downsides are its lack of 24/7 live chat support and a confusing official website. Moreover, there is no free trial. Other than that, we think that you should atleast try VPNArea. >Moreover, a dedicated IP is better than a shared VPN IP address because it doesn’t get noticed by authorities. A dedicated IP has so low activity that the chances of law enforcement looking at it over servers that are generating so much activity. Nope ZOHAIR is ABSOLUTELY WRONG!The best way to hide is in a crowd, rather than standing alone. Even if you are completely covered from head to toe, if their is no one around you, EVERYONE will notice whatever it is you are doing! In a crowd, your just one of many. Also Police do monitor IPS regardless of their activity. There is a reason why many journalists and reporters around the world make use of VPN to communicate with their news agencies. Surely it can’t be that useless.